Each 3 bedroom villa can accommodate 6 persons comfortably. The ground floor bedroom has a king-size bed and the upper floor bedrooms are equipped with double beds. Each room has private bathroom, air conditioning and ceiling fans for comfort. Full kitchen, washer and dryer, living room with in home entertainment units (cable TV, DVD, stereo) library, and safe. Your dining area is located on a shaded veranda where you will enjoy the view and climate of the Caribbean. 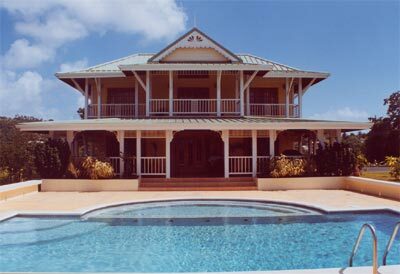 In addition, each villa has a private pool for your relaxation and enjoyment. Included: 24hr security service, personal housekeeper, gardener, a supply of general alimentary (coffee, tea, milk, bottled water, sugar etc...). Meals: personal cook at your request, grocery shopping at your request also before your arrival.